If you are a photography buff or just want to ensure that your photos are preserved perfectly, then you might want to think about getting yourself a photo scanner with feeder. A photo scanner with feeder or sometimes referred to as sheet fed scanner, are the smallest of the three types of scanners (flatbed and drum scanners). All you need to do is put photos or documents in the scanner, and the machine does the rest. This device has been specially designed to scan photographs and other documents, so it comes with much higher resolutions than regular scanners and its software has a bunch of features that help with getting those perfect digital photos. Why choose this type of scanner? With so many different types of scanners available in the market, what makes a photo scanner with feeder so special? There are many reasons why such scanners are a better option. If you looking for an office or home assistant that is hardy and can take care of bulk jobs with great quality, then what you need is a sheet fed scanner. A sheet fed scanner is one of the easiest scanners to use. 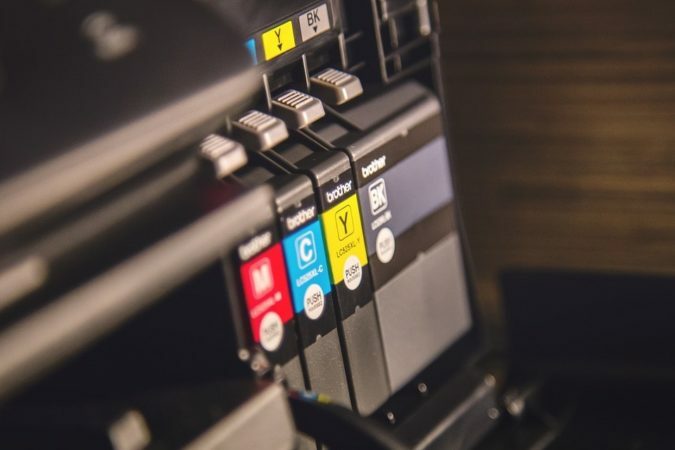 You can just feed the documents or photographs you want scanned and let the software or system take care of the details – as easy as just simply pressing one single button. 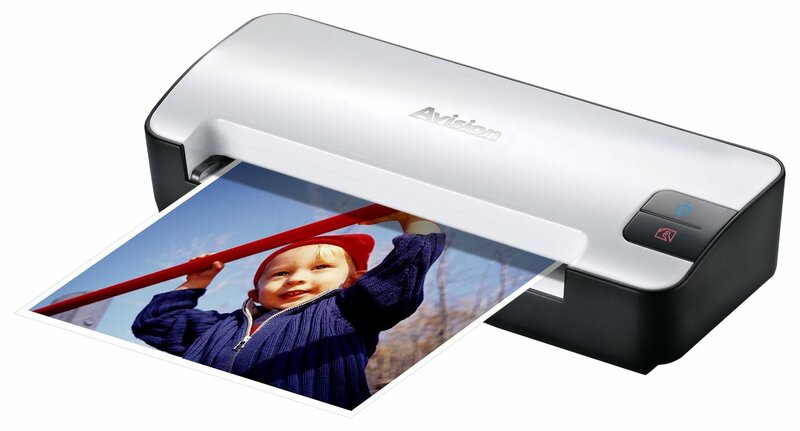 You can buy a sheet fed photo scanner for as little as $35 and go up all the way to $500 plus. It just depends on what you’re looking for. And this doesn’t mean that the inexpensive scanners are not good. They are. Photo scanners with feeders are the smallest scanners in the market. Some scanners are so small that they can fit into your purse and are truly portable. Flatbed scanners and drum scanners are perfect if you are a photographer or designer that needs really high resolution images and small jobs. However, if you are looking for a really versatile, cost effective scanner that also gives great resolution images, then the best choice is a photo scanner with a feeder. Update: A new model upgrade Epson FastFoto FF-680W is now available with 1200 dpi resolution and WiFi connectivity. 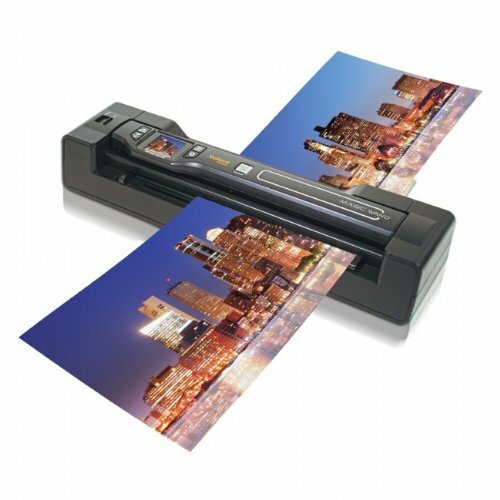 The Epson FastFoto FF-640 has an automated document feeder (ADF), which can hold up to 80 A4 size papers or 30 photos up to a size of 5”x7”. This scanner can fit larger prints up to 8”x10” in size, however these have to be fed manually one at a time. The great thing about this scanner is that it can also scan double sided documents and can even read hand written or printed script at the back of photographs. The FF-640 actually treats documents and photographs quite gently, considering the fact that it uses an automatic feeder which has rollers. The documents follow a straight path through the device, thereby minimizing the possibility of damage to the originals. Epson also asserts that it uses a specially designed roller in its scanner that prevents damage to original prints and it also includes special handling sheets to protect them. When we printed a whole set of photographs, there was no scanner-induced damage to the original prints. And the only problem with jamming that we encountered was when some of the original photos were stuck together – the machine itself worked like a charm. 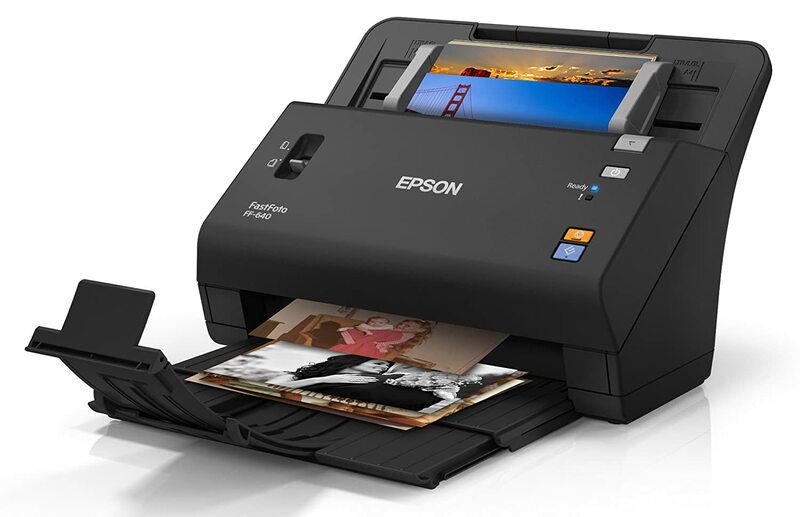 The Epson FastFoto FF 640 is the fastest photo scanner in the world (according to Shutterbug and Techtimes) – it can scan 1 picture per second. This machine also provides images with resolutions as high as 600 dpi, which means you get clear, high resolution images. This package comes with a software that has to be downloaded and installed via an internet connection, and you need a minimum system requirement of Windows 7, 8/8.1 or Mac OS 10.9x to 10.12x. The great part is that it takes just a few minutes to set up the entire system. 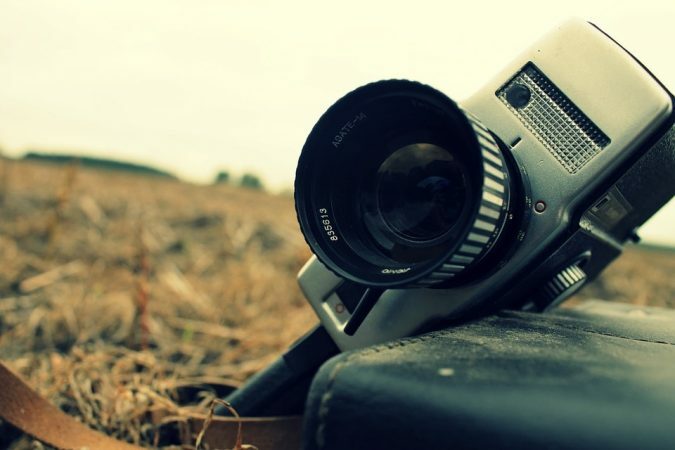 You can also program the app to automatically fix your old photographs using the Smart Photo Fix technology. Overall this is great photo scanner – especially if you plan to use it to digitize all those tons of old family photos that are so precious to you. If you are looking for a photo scanner that’s compact, not too expensive and works fast, then take a look at the Plustek ePhoto Z300. This scanner is very compact and barely weighs 3.3 pounds, making it a great option if space is a constraint. And I love the way the machine looks. It is beautifully designed. The machine is compatible with Windows 7 and above, as well as the Mac OS X 10.8.x and above. It uses a CCD scan sensor (charge-coupled device) that can detect sizes ranging from 1”x1” to 8.5”x11.7”, and offers an image resolution of up to 600 dpi, making your scans really great quality. 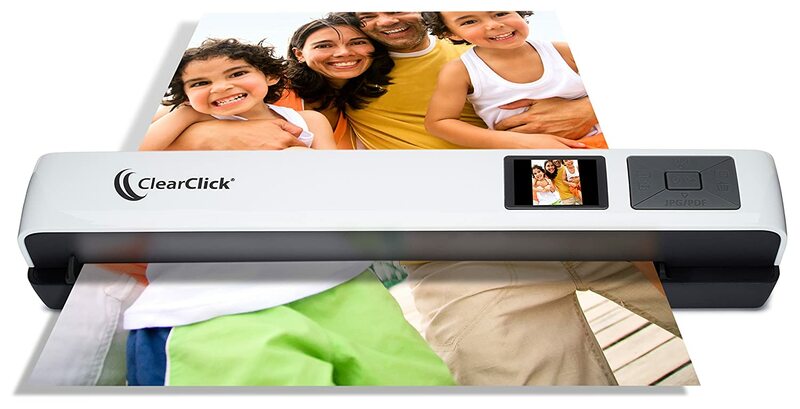 The Plustek ePhoto Z300 can scan 4”x6” photo in 2 seconds and an A4-size document in 5 seconds. The device also has a straight feed design to ensure that each document is handled gently, without damaging the originals. Plustek’s ePhoto software is really simple to use and the best part is the software can be programmed to do it for you. The ePhoto software comes with an automatic crop, de-skewing and image enhancement feature that makes sure that every scan comes out perfect. Overall, this is a really good buy. It’s not expensive, it’s really compact, it looks good and the quality of the scans are great. Time consuming. You have to manually feed in one document or print at a time. Installing the software is complicated. It takes time for the set-up, which can be a little frustrating. But once you get past the installation, the software itself is great to use. 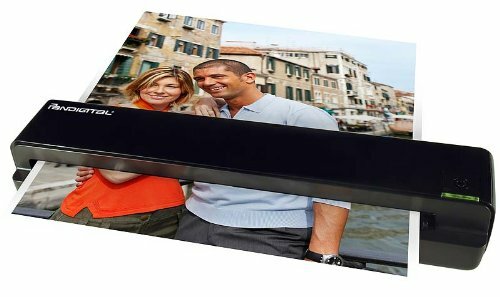 The Vupoint ST470 Magic Wand is the perfect portable scanner, measuring 16.4”x 11” x4.1” and weighing just about 2.95 pounds. The device comes equipped with an auto-feed docking station, a protective travel carry-case, a USB cable, an AC adapter, OCR editing software, an 8GB micro-SD card and a 90-day manufacturer’s warranty. This device, when docked, is so compact that it takes up less than 20% of the desk space a normal flatbed scanner would use. And it has a modern design that I find very attractive. The ST470 offers both options of wand as well as manual-feed scanning (when it is mounted on the docking station), it also has a 1.5” full color LED screen where you can see a thumbnail image of each scan you take. And the beauty of it is that you can do an 8x zoom on the scanned image to check the quality of your scan. I personally found that using the docking station made it easier to scan documents as the wand takes a little getting used to. However, once you do get used to the wand, you can actually scan anything with a decently flat surface. The trick is in holding the wand steady as you scan. And if you’re worried about the quality of the images, they’re really good too. The ST470 offers up to 1200 dpi scanning and can scan documents that are 8.5” wide and up to 125” (10 feet) long. The wand has a rechargeable lithium battery that can scan up to 400 documents when fully charged. Value for money at under $200. A fully portable scanner that is packed with features. 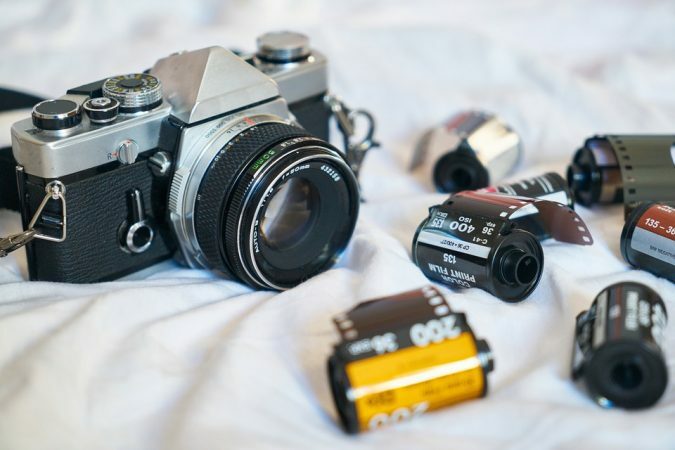 Requires no software; the computer recognizes it as a digital camera. The Doxie Go SE Wi-Fi scanner is a really nifty little device. It is small – the size of a rolled up magazine – and weighs 1.98 pounds. It has a rechargeable lithium battery that allows you to scan up to 400 documents when fully charged, so you can take it anywhere with you. This scanner doesn’t need to be connected to a computer to scan documents. It comes with inbuilt 2GB memory and also has a standard SD card slot for additional memory. 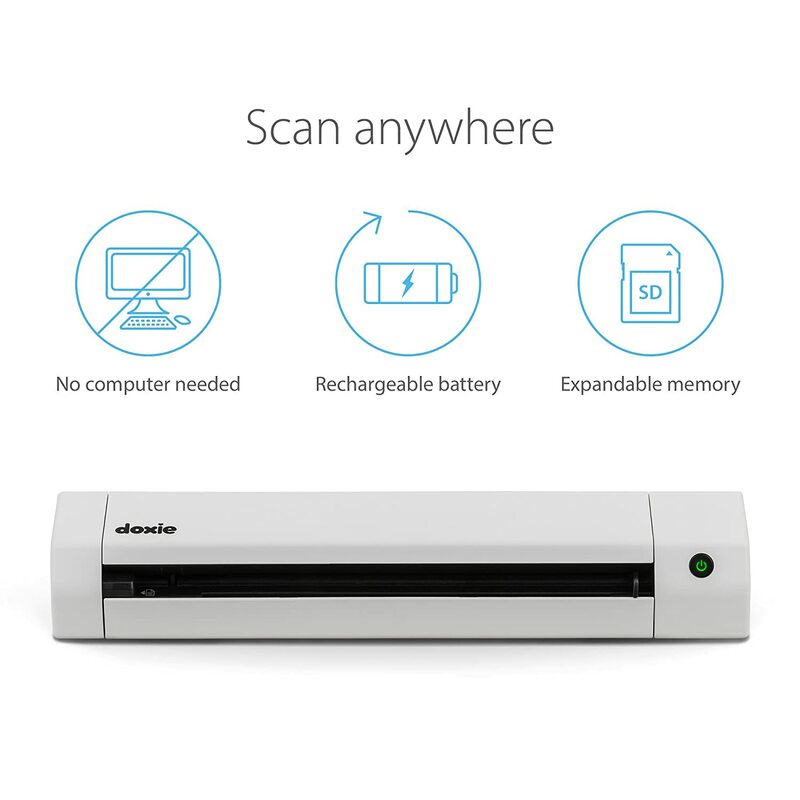 The Doxie Go offers both 300 dpi and 600 dpi scanning quality options and it also has the auto-adjust facility to ensure that your scans are cleaned up nicely. Even if you feed in the documents a little unevenly, the auto-adjust option will de-skew the image for you. The scanner is both PC and Mac compatible and comes with its own Doxie software (which you can download from their website). And the best part about this device is that it has Wi-Fi. There is a Wi-Fi button at the back of the scanner that syncs the Doxie scanner with your PC or Mac. You can even sync the device to your iPhone or iPad using the iOS companion app and share your images wherever you are. Doxie also recognizes the text in your documents and can create searchable PDF files. The Fujitsu ScanSnap iX100 Wireless Mobile Scanner is a completely portable device that weigh only 14 ounces. You can use the wireless option to send your documents directly to your smartphone, tablet, desktop or even your cloud drive. Its rechargeable battery allows you to scan up to 260 documents in one charge. The ScanSnap also offers up to 600 dpi image quality scanning, has the option of continuous document feeding and can scan a full color page in less than 5 seconds. The OCR technology in the scanner lets you create searchable PDF files, as well as Excel and Word files that can be edited. The scanner’s software has an intelligent scan correction facility so that each image comes out perfect. Another really great feature that the ScanSnap has is that if you have a large document, you can fold it in half and scan both sides. Then the iX100 will automatically “stitch” the two images together so that you end up with one just like the original. The document can either pass through a straight scan or you can use the flip top to control the direction of the document and let it exit the scanner vertically. It’s a nice little function if you don’t have enough space. A neat little trick is that the ScanSnap can scan multiple business cards at the same time and will save them as separate documents. You can only connect to one computer at a time. You need to manually connect to the computer, sync it with the scanner and only then will it work. 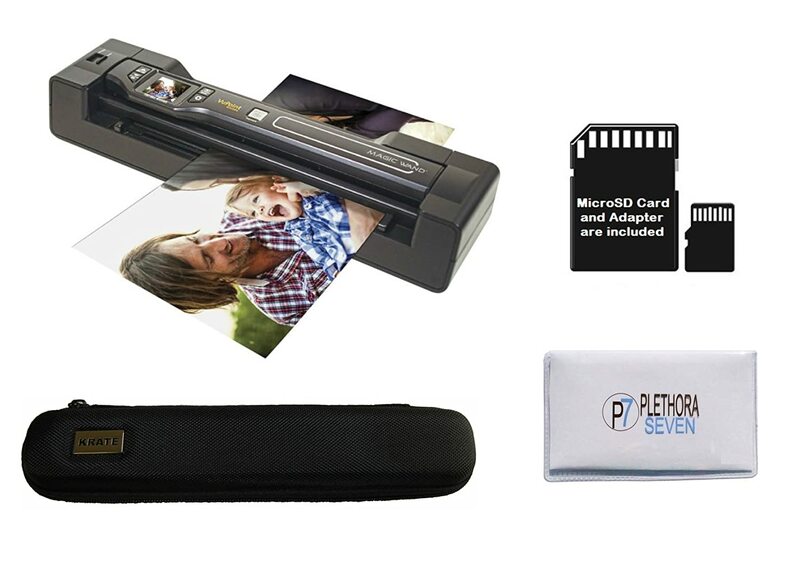 Another really great portable scanner, the Pandigital Personal Photo Scanner weighs just about 1.72 pounds and allows you to scan to memory without needing to connect to a computer. The focus for this scanner is its ease of use – you don’t need to download any software to use it. You can scan photo as large as A4 sizes which are converted into JPEG images with a scanning quality options of 300 and 600 dpi. 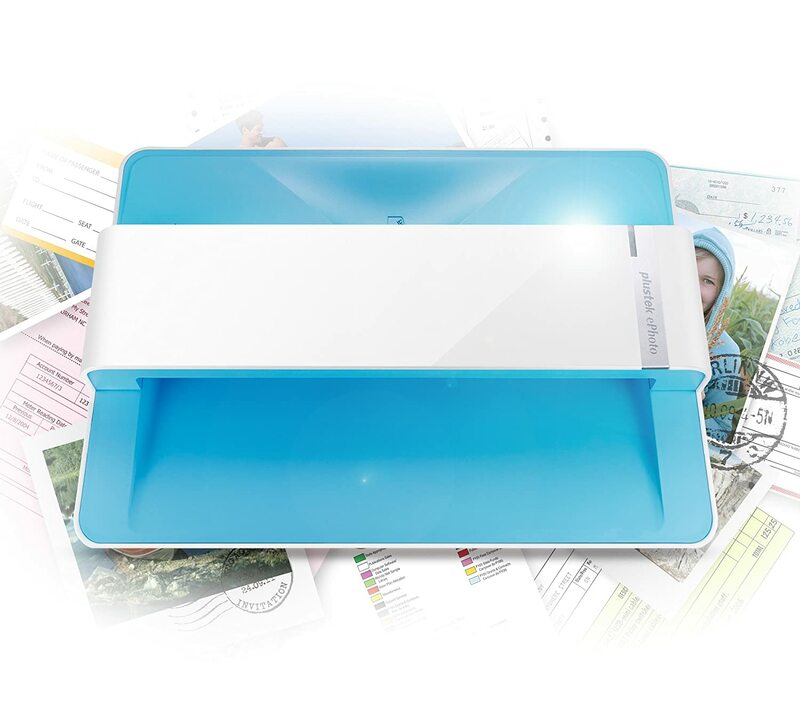 The Pandigital Personal scanner has a manual sheet-fed design that makes it quite portable. Unfortunately, the device is not completely portable since it will only run on AC power, so you need to be near a power source. There is no setup required; you just need to insert the 1GB SD card and you’re ready to scan. Pandigital says that besides the SD card, the device can also work with XD, MS, MSPro as well as MMC cards. The scanner is both PC and Mac compatible. To transfer the scanned images from the scanner to your desktop, simply remove the SD card and insert it in the desktop, after which you can copy the images to your computer. The device uses rollers because of its sheet-fed design. This means that your photo can get damaged if you don’t use the plastic cover sheet while scanning. The Vupoint Solutions Magic Wand is an amazing hand-held portable scanner that will scan pretty much any flat surface. In fact, one of the things that users of the scanner love is that if you have old photo albums where the photographs have been stuck to the pages, then this is the perfect device to use. You simply place the scanner over the page and it will scan all the photos on that page. Then, you can use the Vupoint Paperport 14 software to edit the pictures to your satisfaction. The Magic Wand has an inbuilt color LCD display panel so that you can check your scans to make sure they’re ok. You can even zoom into these scans as the panel has an 8x zoom option. The auto-feed docking station is also really helpful. For those of you not too comfortable using the hand-held wand, simply fit the scanner into the docking station, and you instantly have a single-sheet auto-feed scanner that gives you increased accuracy and resolution (up to 1200 dpi). The scanner is fitted with a lithium polymer rechargeable battery for portability, but you can use the docking station as a charging base for your Magic Wand. Completely portable, with a 32GB SD card memory so that you don’t need to connect to a computer to scan. Docking station has to be plugged in to work – you can’t use it on the Wand’s battery. The Avision IS 15+ is a really great option for those looking at getting a budget friendly business card and photo scanner. It’s small and portable and weighs just 11.2 ounces. 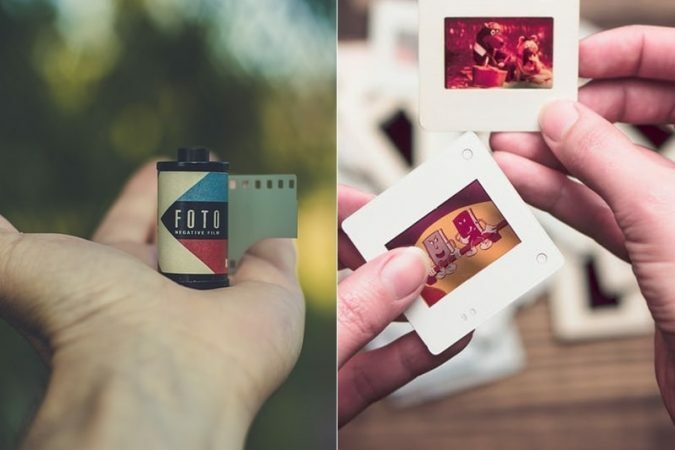 The IS15+ has three options for image storage – you can insert the 4GB SD card that comes along with the package, use a USB flash drive or connect directly to your computer. I used a USB flash drive for the test. Simply plug in the flash drive, choose either the 300 dpi or 600 dpi option, insert the photo into the feeder and that’s it. It takes all of 5 seconds. I then plugged the flash drive to my laptop and found it really easy to access the image. You will find all the images saved in the “DCIM” folder. You don’t need to download any extra software for this device. And the image quality was excellent, both at 300 and 600 dpi. The IS15+ has a built-in de-skew and auto crop function, so scanned images are processed as they are scanned. Images are saved as JPEG files and you can access them on your PC or your smart phone or tablets. Really affordable at under $40. Needs an AC cord to operate; would be great if it were also battery operated. There is no auto feed option so and you have to feed one photo or card at a time; can be time consuming. Can’t see the results of the scan immediately unless you are connected to a computer. The ClearClick Photo & Document Scanner is another great portable scanning device. You don’t need to be connected to a computer or download software to use the scanner and view your images. And when you do connect to a computer, it can be done completely wirelessly. Here’s how you start using your ClearClick scanner. You load 3 AA batteries into the device (you need to buy the batteries separately as they are not included in the pack), make sure the pre-inserted 4GB memory card is where it should be and give the power button a long press. And start scanning. Thanks to the auto-feed mechanism, you only need to load the photo or document. Scanning takes mere seconds and will show up in the device’s 1.45” preview LCD screen. The ClearClick scanner can scan documents up to 1200 dpi and convert them into either JPEG or PDF files. The ClearClick pack comes with a DirectScan OCR software CD, which you can download onto your PC. Then, you can scan your documents directly to your computer and convert them to text. For this, however, you need to make sure you have Windows installed on your desktop. For Mac users, you would need to scan the images on the scanner and then transfer them to your Mac before you can work on them. Battery consumption is high, so ensure that you carry a power cord with you, or keep the device plugged to a power source. The Brother DS-720D is a mobile color page scanner that has the duplexing facility and is a great work companion as it speedily scans photos, documents, receipts, embossed plastic ID cards and business cards. 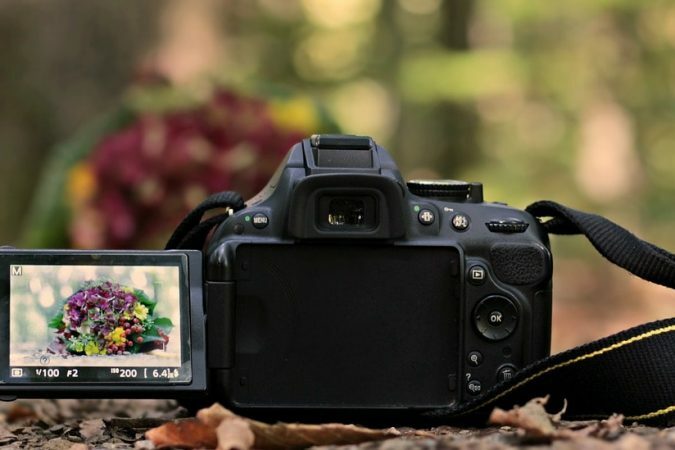 The DS-720D is compact and lightweight and completely portable. You don’t need batteries or power cords to charge the device. Simply plug it in to your computer and it works. This scanner also offers fast double-sided scanning. The DS-720D can scan up to 8 pages per minute and can scan up to 5 pages per minute for double-sided scanning. You can load documents up to a size of 8.5”x37” and can create searchable PDF documents too. The device also gives you three options of image resolution – 300 dpi, 600 dpi and 1200 dpi. The great thing about this scanner is that you can scan directly to different destinations. You can scan directly to your email, to a file, an image, OCR, FTP and even a shared folder. You can even print the document directly from the scanner. The DS720-D scanner is compatible with Windows, Mac and Linux and comes with a suite of software to help you manage your documents more efficiently. 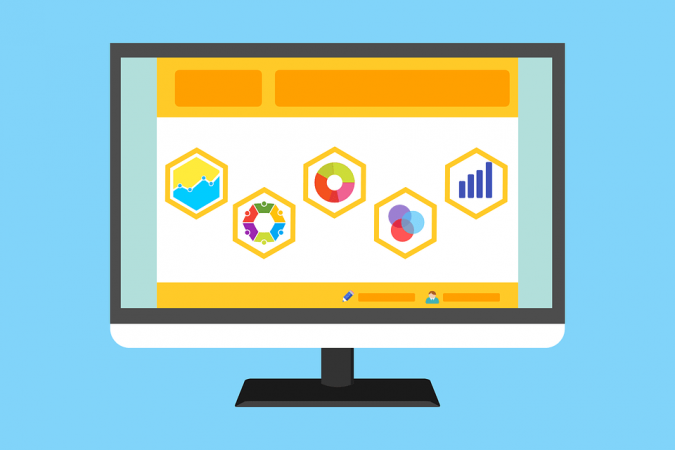 The suite include Desktop Document management software for both PCs as well as Macs which can help you export your scanned documents directly to your email. The suite also has a software to manage your business cards. The BR-Receipts software in the suite is perfect for managing your receipts. It can sort your receipts as well as create expense reports for you. Consider These Following Factors Before Buying Your First Photo Scanner with Feeder. 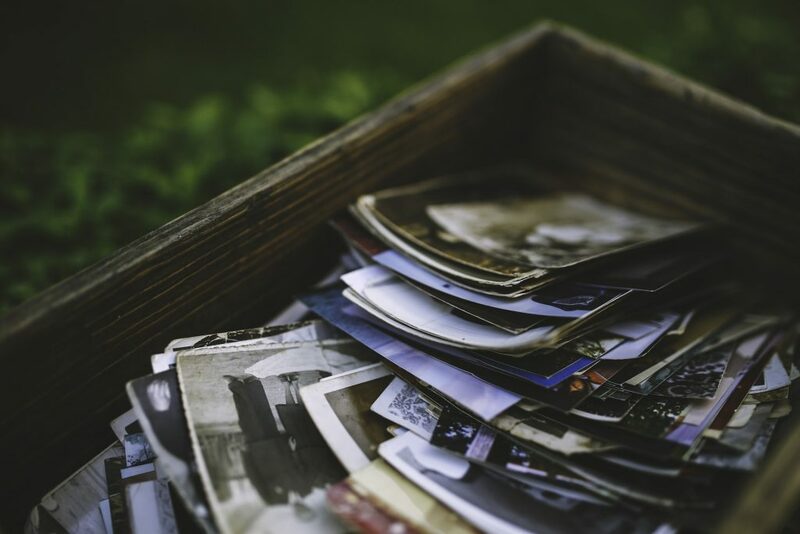 If you plan on using your scanner to go through stacks of receipts, household bills, documents or boxes full of photographs, look for the automatic feed option in your photo scanner. Scanners such as the ScanSnap iX100 and the Epson FastFoto FF-640 can take 50 to 80 sheets of paper in one go. If you’re planning a large numbers of scans, then opt for the duplexing facility. There are a number of photo scanners that can scan both sides of a document simultaneously, thus saving you a lot of time. Photo scanners can range from the simple 300 dpi resolution to the super high resolutions at 6400 dpi. At 6400 dpi, you can scan a tiny image and blow it up into a poster sized print with perfect clarity. For most home based scanning, resolutions between 300 dpi and 1200 dpi are good enough for some really good quality images. For document scanning, 300 dpi is more than enough. However, for photographs, a minimum of 600 dpi would be ideal. DPI stands for “Dots per Inch” and is a critical measure of the clarity and quality of an image. One dot (on the paper photo) gets converted into one pixel when the photo is being digitized. So, the higher the DPI, the better the resolution and picture quality. Most scanners connect to PCs via USB cables. However, there are a lot of options of going wireless or just not connecting to the computer at all while scanning. If you need to scan documents on the go, then you can look at the option of portable scanners that can use Wi-Fi connectivity or have large storage. Closely related to the question of connectivity. If you need to travel, then look at the battery options or how well they can power up with a laptop connection. Do you need to be able to send the data immediately or can you simply store the documents you have scanned while on the move? Optical Character Recognition (OCR) is necessary when you need the documents you scanned to be converted from an image into a text. If you need this kind function, then make sure you buy a scanner that comes with OCR software. These tips are just a guideline for you to start your search. Remember to do your homework before you finally settle on one photo scanner.